Miami County deputies investigated a fatal crash on State Route 571 near State Route 201 June 30. 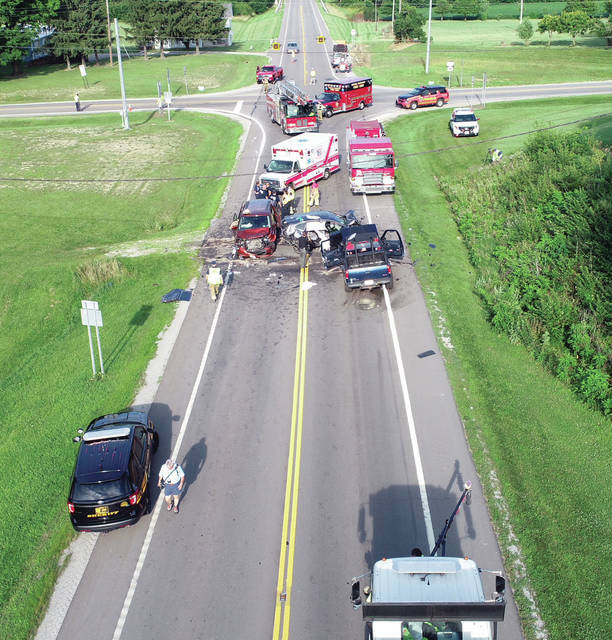 MIAMI COUNTY — A Sidney man has been indicted on one count of vehicular manslaughter, a second-degree misdemeanor, for his role in the death of a New Carlisle man killed a three-vehicle accident at state routes 571 and 201 in Bethel Township on June 30. Charles Robbins, 60, of Sidney, will be arraigned on the charge on Dec. 11, in Miami County Municipal Court, according to court records. Dan Hasting, 54, of New Carlisle, died in the crash, according to the Miami County Sheriff’s Office. His wife, Elizabeth Hasting, 52, was a passenger in the SUV and sustained serious injuries. According to reports, the crash occurred when Hasting’s westbound Honda SUV had slowed for a highway-striping vehicle when it was struck from behind by a westbound mini-van. Robbins was the driver of the van. Robbins’ wife Janet, 70, of Sidney, was also injured in the accident. The impact forced the Honda into the eastbound lane, where it was struck by an eastbound pickup truck. The driver of the pickup truck, James Elkins, 42, of New Carlisle, struck Hasting’s vehicle again after it was rear-ended and pushed into an oncoming traffic lane. The crash was investigated by the Miami County Sheriff’s Office. https://www.dailycall.com/wp-content/uploads/sites/30/2018/11/web1_063018tralow_crash_sr571_fatal1.jpgMiami County deputies investigated a fatal crash on State Route 571 near State Route 201 June 30.